Siloed threat intelligence. Today’s security teams rely on threat information from disconnected, often conflicting sources. This results in higher false positive rates, increased cost, reduced effectiveness, and erosion of trust. Moreover, information silos between network and security teams can lead to security gaps, slower vulnerability detection, and costly remediation delays. Lack of threat context. Security personnel are inundated with thousands of alerts and no clear way to know which ones to act on first. Organizations lack visiblity into core network services that can provide context to respond with maximum efficiency to the most critical threats. Manual processes. The ability to respond to fast-moving cyber threats with certainty and speed is paramount. Yet, many security organization use manual and time consuming processes and analysis to prioritize threats and identify context. This results in longer remediation times or worse still failure to act on threats. As the leader in Secure, Cloud-Managed Network Services, Infoblox enables you to close the gaps in your response and elevate your security posture to the next level. Accelerate response, rapidly detect, prioritize, contain, and remediate threats —all while ensuring business continuity and infrastructure efficiency. Respond to security incidents faster and more effectively using consolidated, high quality threat intelligence. Our in-house threat research teams aggregate, verify, and curate the latest intelligence from multiple sources. 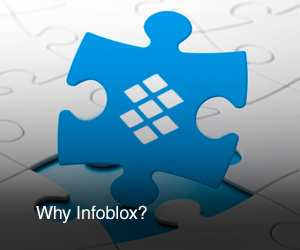 With Infoblox, you can eliminate conflicts among sources and automatically distribute uniform threat intelligence throughout your security infrastructure, providing all systems with a single source of truth. Enable your existing security infrastructure to work in concert to raise your security posture using automated orchestration. With our solution, you can automatically share network events and indicators of compromise in real time with existing security tools such as next-gen endpoint protection (NGEP), next-gen firewalls (NGFW), Network Access Control (NAC), vulnerability scanners, and SIEMs. For example, when Infoblox detects DNS-based data exfiltration or malware from an infected host, it can automatically notify an endpoint security solution to clean or isolate the endpoint. When a new device joins the network, Infoblox can trigger a vulnerability scan or initiate a NAC solution to prevent the endpoint from getting on the network until it’s made compliant. With Infoblox, security analysts and researchers can quickly investigate threats using a single consolidated search tool. Security specialists can access rich context, including type of malware, domain registration information, and associated campaigns. Through the versatile Infoblox API, analysts and responders can rapidly glean insights into specific indicators using consolidated data from diverse sources, including antivirus analysis, domain reputation score, anonymized passive DNS query data, and “who is” information, among others. Through Infoblox, your security teams can gain a wealth of security insights by harnessing data residing in DNS, DHCP, and IPAM (DDI) services. Data contained in these services reveal a goldmine of information, including which devices and destinations are associated with specific attacks or which network assets warrant enhanced protection. In addition, your operations teams can quickly determine the scope of a security incident or automate correlation of network context and data with security events. They can also access audit trails to profile device and user activity.